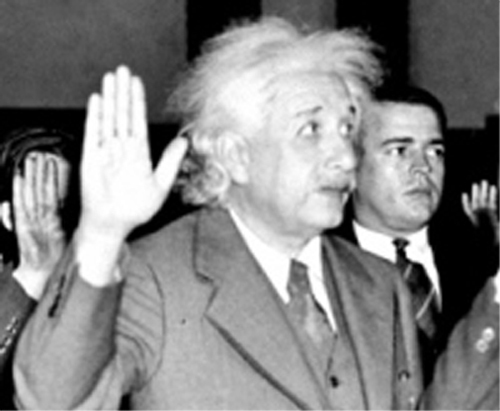 In 2009 I introduced an article about the hands of Albert Einstein - was is regarded as one of the brightest minds in the history of human kind: his name became known as a synonym for the word 'genius'. In 1999 Time named him the person of the 20th century (ahead of the two runners-up: Mahatma Gandhi & Franklin D. Roosevelt). First, this review will describe why Albert Einstein became famous. Second, we'll find out what his hands reveal about his independent personality. Third, we'll discover two hand characteristics which can be related to the believes of UK researchers that Albert Einstein displayed signs of autism. 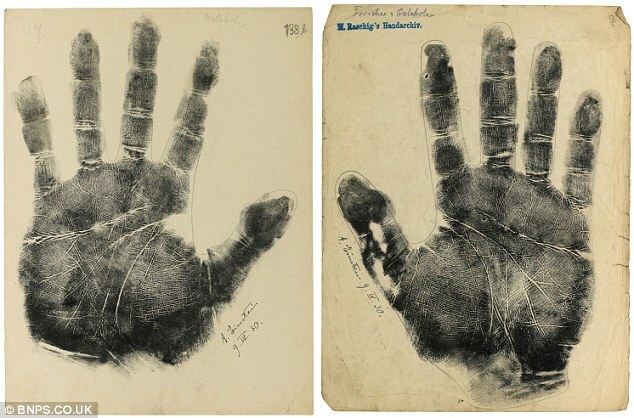 Fourth, both hands reveal evidence that Einstein indeed had an inclination to left-handedness. 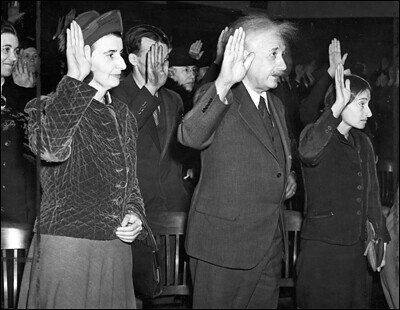 And finally, I'll presents some other reviews of Albert Einstein's hands presented by some experienced hand experts. • 1 - Who was Albert Einstein? 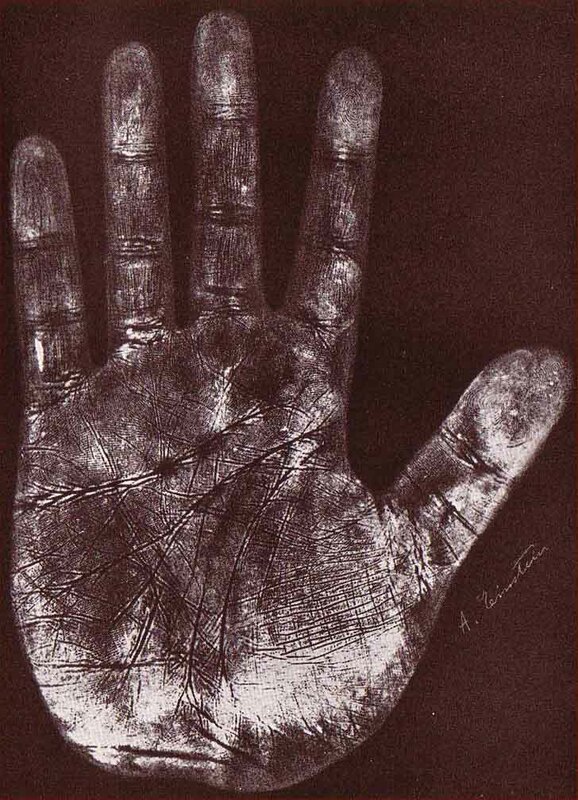 • 2 - The hands of Einstein & his independent personality! Thanks for posting these fascinating prints. I inverted the images in photoshop and the lines jumped right out at me. Looking at his left hand, what struck me immediately was the thick, dominant thumb, the dramatic fork in the head line, and the presence of a long hypothenar bar. In fact, I am not quite sure if I am making out two concurrent forks on the head line. The asymmetry between the two hands is absolutely amazing. .... 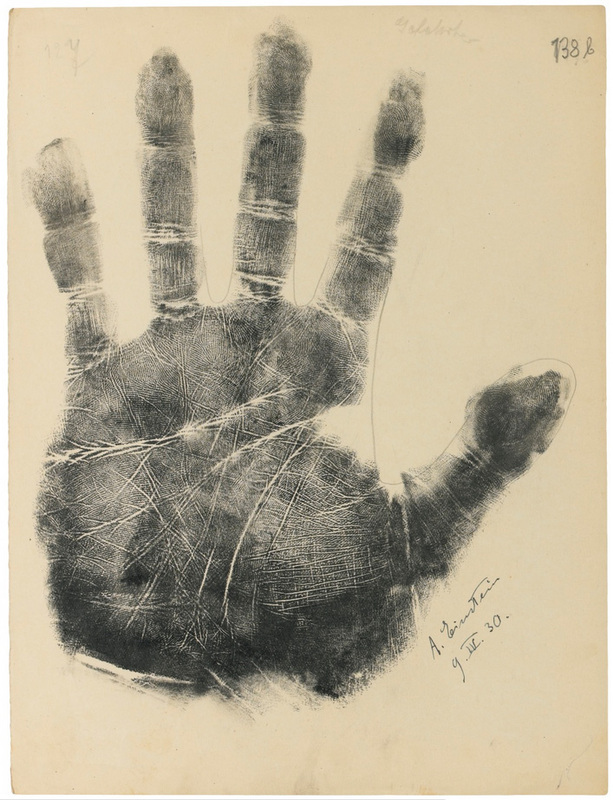 The photo above sort of proofs that Albert Einstein's handprints give an incorrect impression about his finger length. 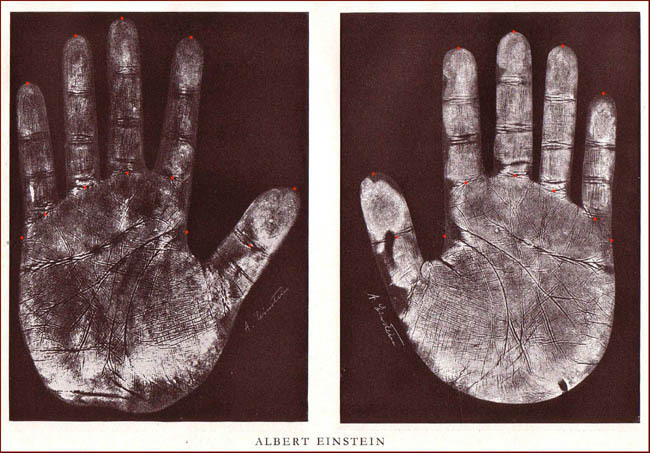 Because, while the handprints suggest that Einstein had (abnormal) short finger length (relative to both palm length and palm width) - especially for his right hand... various photos of his right hand indicate that his finger length (relative to palm length) was actually slightly longer than average! His right hand finger length relative to palm length was probably at most only slightly shorter than average. PS. 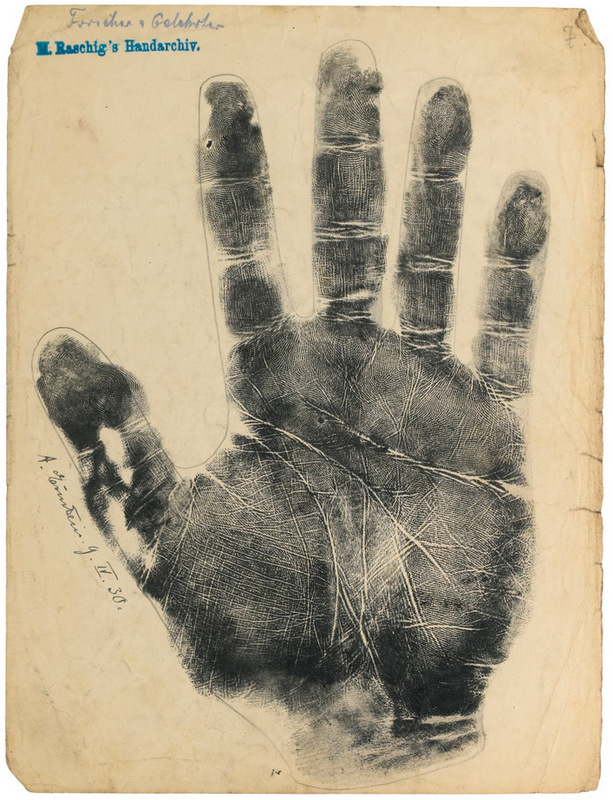 The true length of the third finger in his right hand is probably up to about 3% longer than suggested by the hand print of his right hand; this is indirectly also indicated by the fact that in this hand print the distal phalange of the middle finger is actually shorter than the distal phalanges of the 2nd finger and 4th finger - which is a very unnatural characteristic, while the photos also proof that Albert Einstein's distal phalange of his right third finger has a normal length: much longer than the distal phalanges of his index finger and ring finger. The hand prints above concern another version of Albert Einstein's hand prints! NOTICE: This is not the original of the 'dark' version... because we can see that the location of the written name is different. PS. 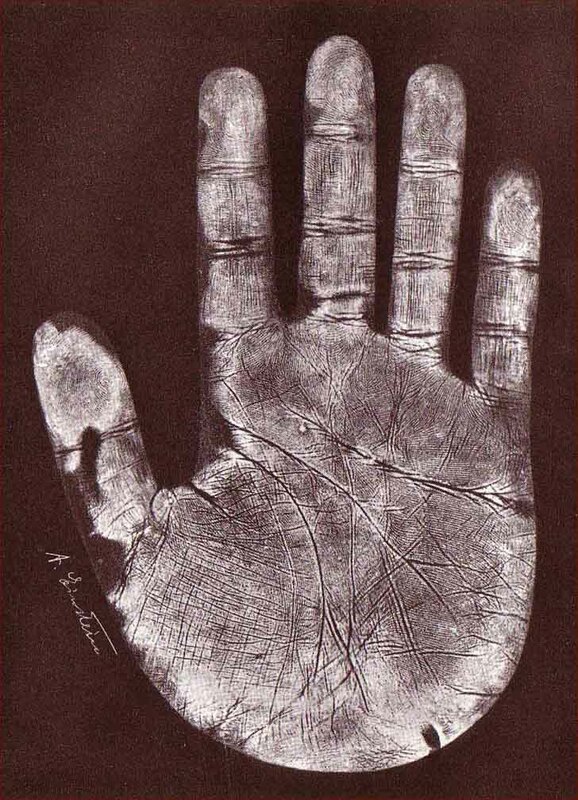 Both hand prints were made by the German palmist Marianne Raschig who spent 60 years taking more than 2,000 handprints of around 1,000 leading artists, actors, scientists, musicians and writers in Berlin. I did not know which section to post this to......Moderators may shift this wherever they please. I wish we had more palms of Scientists for study. I greatly respect all true Scientists who usually have suffered yet proved themselves to be successful.